Before family and friends State Representative Dan Brady (R-Bloomington) today took the oath of office to represent the 105th House district in the new 99th General Assembly. House members were sworn in at noon Wednesday at Sangamon Auditorium at the University of Illinois at Springfield. The new 99th General Assembly will serve until January 2017. 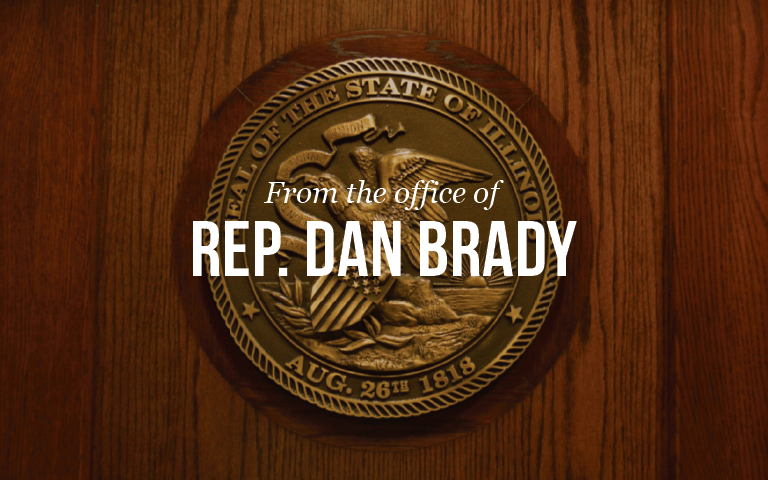 Representative Brady, who is beginning his 8thterm representing local communities in the Illinois House, said this year truly has the feel of a “new beginning”“It is truly an honor to serve my constituents here in Central Illinois,” said Representative Brady. Representative Brady encourages residents of the 105th district to contact him with questions or concerns as the session moves forward. Representative Brady’s Normal district office can be contacted at (309) 662-1100, and he can be reached via e-mail at dan@rep-danbrady.com. Constituents can also visit his legislative website at www.rep-danbrady.com. Rep. Brady represents parts of McLean and Livingston Counties, including a large portion of the Bloomington/Normal metropolitan area.